What's the overall vibe of the Austin music scene? The Austin music scene is flourishing. It doesn't matter if you're into metal, alternative, country, EDM, pop, hip-hop, or punk – your scene has many places in this city. It's really awesome to see. When huge festivals like SXSW and Austin City Limits aren't happening, what's the "normal" scene like? When huge festivals aren't happening, music moves around in the city. Shows are regularly going on in the Red River district, which tends to be the epicenter of music venues in Austin. There are nationally touring acts, similar to large festivals, and also local acts play regularly which differs from festival season. In the same weekend, Scoremore hosted a show with Girl Talk and Ludacris, Purity Ring played at Stubb's, and Swan Dive had a secret back patio DJ set by the Wrestlers. With the "Live Music Capital of the World" as the city's motto, how difficult is it for a band to get booked in an Austin venue versus another city? Is there fierce competition, or are there enough venues to go around? It's probably easier for a band to get booked in an Austin venue since we have multiple venues that actively play live music on any night of the week. The better the band, the better the venue. There's competition when you have larger touring acts vying for venues in prime locations with a powerful marketing team. The bigger the artist, the more competition there will be for their show at any particular venue. What factors do promoters like you consider when trying to determine if a band is worth booking? Promoters like to check out the sound of the band and see if it will fit the typical venue audience. Another important factor is always how much draw the band will have since people get paid from ticket and bar sales. A perk is whether the band has a "wow" factor to them, like onstage performances or theatrical costumes/stage designs. Compared to other cities, what's the most important thing that bands need to know about working with promoters and venues in Austin? The most important thing bands need to know about working with promoters and venues in Austin is that this city is perfect for any area of growth. If you're a beginner band, there's a venue for you. If you're a huge headliner, there's a venue for you. If you're a band that falls in between those two, do some research – see how venues promote and ask questions. You might find three venues that fit your needs, but one that has a better reach to the type of crowds you're trying to reach. What's the best way for an out-of-town band to break into the Austin market? Send emails to the venues or reach out on social media. What will venues generally provide for entry- and mid-level bands? You'll get a stage, sound technician, sometimes a backline, and a few drink tickets. You'll also get promotion on various platforms within the city that allow people to access Austin's entertainment. We are fortunate to have outlets like Showlist Austin and do512 among others. What are the most common payment structures that bands will come across at Austin gigs? Most of the time, you'll get a door deal. If you don't get a door deal, then you'll probably get a bar deal. Sometimes there's a guarantee, sometimes there's not. 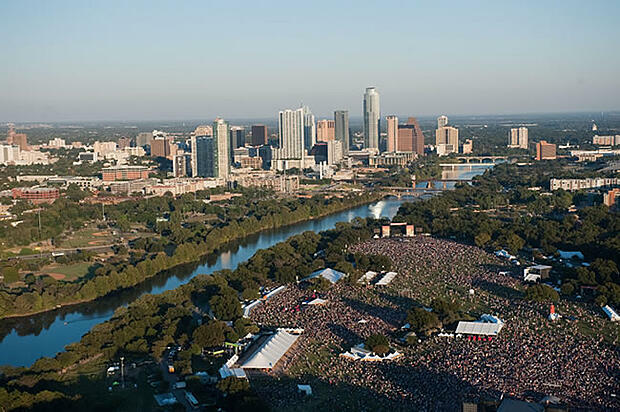 Where do you see the future of Austin's live music scene heading in the next five to 10 years? I see it thriving. Even looking forward to X Games in the next few weeks, there are some of the coolest show combinations I've seen all year! This city has a sound that never really takes a break, and it's one of the reasons why I love it here so much. Infinite possibilities, and potential for growth and movement. If you're ready to head southwest, the Swan Dive Summer Series is booking 10 Sonicbids artists for dates in July and August. Head over to the gig listing to apply for free by June 26!